Hallowe'en is so much fun! I love seeing all the kiddos dressed up in costumes, pumpkin carving, pumpkin flavored everything, and the creativity that is part of it all. I think I even like Hallowe'en a little more than Christmas, but that may be because I don't like all the commercialism that goes with Christmas! 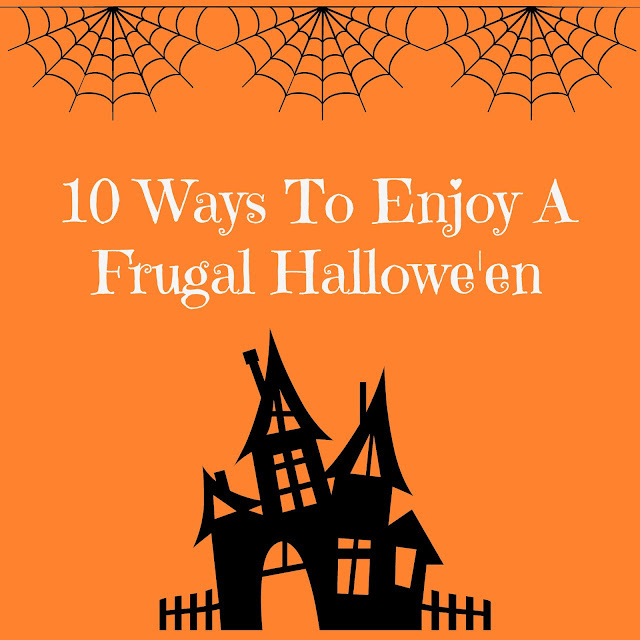 Hallowe'en can be done frugally, very frugally. For several years, we have not bought many costumes nor spent a lot for decorations. I am not one to put out many (if any) holiday decorations, but my kids do put out a few as does my mother. That decorating gene skipped a generation in me. 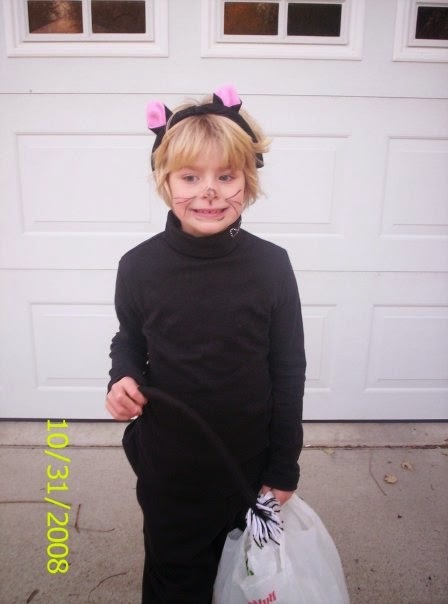 Paige's costume was a cat. Grandma made the headband and tail. The rest we had! 1. Make your own costumes. This may be a "duh" thing, but so many people find it easier to buy the costumes (including me). However, my girls would use their play clothes as costumes and love it. My mom made them costumes a couple times. We also passed costumes down from kid to kid and borrowed costumes from others. We also bought two non-gender specific costumes when they were babies and toddlers that all my kids wore. The first year they were Pooh and the second year they were Tigger. Dane decided to be many different superheroes in one. 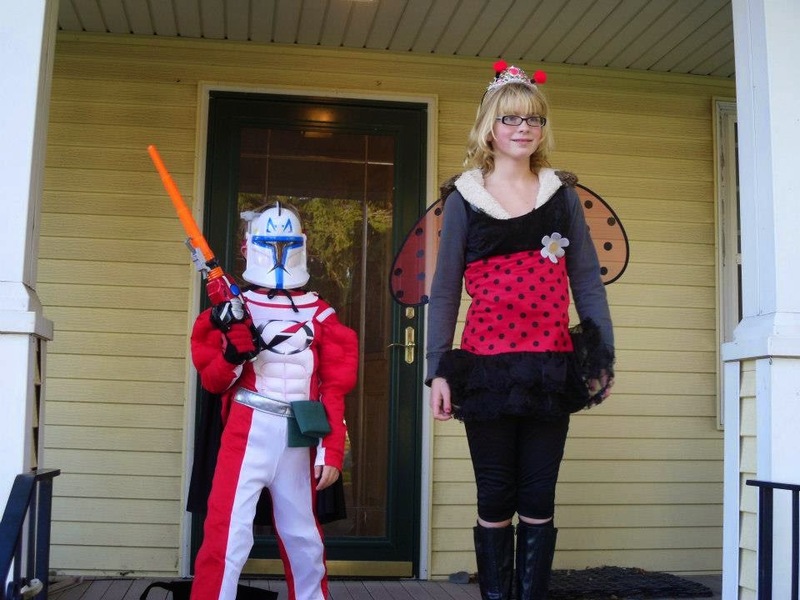 Paige was a ladybug. Part of her costume was purchased and part of it was things we had. 2. If you have to buy a Hallowe'en costume, wait until they are 40-50% off or raid your local thrift shop. Also, buy the costume a size or two too big. That way you can get two years or more out of the costume. My kids would also add their costumes to the dress up box and wear them all year round. You might as well get your money's worth out of them. 3. Make your own masks for Hallowe'en. In Iowa, the weather is rather unpredictable at Hallowe'en time. We could have warm, mild weather and we could have a very cold, breezy weather. Sometimes the kids are so bundled up that it isn't worth dressing up in a costume. Just wearing a mask makes sense. You can use flexible cardboard, brown paper bags, some elastic to hold it on, and let the kids decorate it however they want. 4. Use cloth grocery bags for trick and treat bags. Seriously, these bags are the bomb! They don't rip easily. They can handle being dragged by your kids walking down the sidewalk. They can hold a lot of weight. If you are concerned about the colors of the bags not being right, use black, orange, or purple ones. However, I am not worried about such things. 6. Have a truck and treat. If you don't want to spend long hours walking or driving around, gather a group of friends into a big driveway or parking lot. Most people decorate their car trunks and have the kids go around getting treats. Sometimes they also play games, have some drinks like apple cider or punch, and maybe even a potluck. You only have to have a certain amount of treats and you save money on fuel. To me, this sounds like a lot of fun! 7. Carve and/or decorate pumpkins. This is one of those things that can be incredibly messy, but fun! You don't need to have carving kits to do this. You can find patterns online for free if you want to go that direction. You can use paint or markers. I would wait to do this though until the week of Hallowe'en. The pumpkins can deteriorate quickly if done earlier. If the pumpkins are still in good shape after Hallowe'en, you can cut them in half and roast them for them. The pumpkin seeds can be roasted and eaten. The pumpkin pulp can be used in cookies, pies, muffins, etc. 8. Choose an area that you can walk to all the house you want to go to for trick and treating. Driving around and stopping a lot wastes a lot of gas. We live in the country and usually head to the closest small community. Very few of my neighbors have treats for trick and treating so this works well for us. 9. Have supper ready to go when you get home from trick and treating. I usually have something in the oven or in the slow cooker. This will help you avoid going out for supper because you are tired. It will also help the kids absorb the sugar better instead of bouncing off the walls all night. Better yet, they will eat less candy because they ate a filling meal. 10. Decorate with items that can be used longer than Hallowe'en. I have a tendency to decorate for fall rather than Hallowe'en. I use pumpkins, candles, runners, and maybe corn stalks. I like to decorate for several months at once and use things that can be reused or made into food later. I don't use gourds as I find them a waste (what do you do with them afterwards?). Most of my decorations are either given to me or I get for free. Just ask around for pumpkins or let your kids go on 4-H trips to the local pumpkin patch. They also come home with one or two. That is how we celebrate Hallowe'en frugally! What ideas do you have?